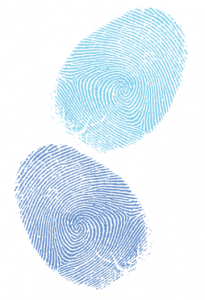 Fingerprints are known to be important clues in solving crimes—but in predicting and preventing disease? That’s right, says a Longwood biology professor who played a key role in a study that suggests fingerprint analysis can predict, as early as 17 weeks after conception, who is at risk for developing diabetes, a disease that is estimated to affect more than 29 million Americans. Dr. Björn Ludwar’s role on the research team was to develop an inexpensive and easy way to analyze a person’s fingerprints, which surprisingly can be indicators of health. The less similar the prints on your left and right hand look — in other words, the more asymmetric your hands are — the higher your risk might be to develop diabetes later in life. Ludwar’s technique expands on wavelet analysis — the same tool the FBI uses for archiving fingerprints — to check for asymmetry. “Our findings could eventually lead to the development of a cellphone application to determine the risk for developing diabetes and associated health problems later in life,” said Ludwar, coauthor of an article about the research published by the Journal of Diabetes Science and Technology. The study, led by Ohio University biology professor Dr. Molly Morris, was based on the concept of fluctuating asymmetry,” which maintains that an organism’s genetic ability to cope with environmental stresses is reflected in deviation from perfect bilateral body symmetry. The greater the deviation, the less one’s ability to cope with environmental stress— making it more likely for certain diseases to manifest later in life. Ludwar’s job was to quantify fingerprint asymmetry of the 340 research participants, about 200 of whom had been diagnosed with Type 2 diabetes and another 57 with Type 1.